By F. W. Elliott Ltd. of Croydon. Type 1 'Operations Room' clock with a 14" silk screen printed dial with an extremely rare ‘winged RAF crest' and a solid mahogany 18" diameter case. Eight day Elliott signed single fusee movement (serial number 4008) with 1938 date. The dial is in original condition. Totally unrestored, this is generally very good but does have issues - fortunately these are mainly hidden by by the bezel. When the dial is exposed, chipping, flaking and paint loss is revealed. This is worst at the lower edge of the dial (around the ‘6’). Some paint is a little unstable and could potentially be ‘picked off’ but this area does not extend too far inwards. There are other small paint chips here and there and some slight ‘bubbling’ of the paint around the winding key hole but this isn’t too serious. Light overall grime on the dial is visible in the close up photographs but not really obvious when viewed normally. With a totally stable dial this could probably be cleaned but I wouldn't entertain it with this one. It has been suggested that application of matt varnish would help stabilise the flaking paint but I think this kind of intervention is ill advised and would be irreversible. The super RAF winged crest remains in very good condition and the coloured sectors retain strong colour. The case has a few minor bumps/scratches and there is minor opening of the joints but it is in fairly good overall condition. Two of the original dowel pegs remain, one is perhaps a replacement and one is absent. These are not difficult to obtain. The back box is stamped with Elliott and Air Ministry crown marks and 1939 date. The lower access door lock retains the lock but the key is absent and the side access door is good/complete with rotating 'closure stop'. The case retains the original top hanger plate and one of the two lower stabilising brackets. It is fitted with an excellent cast brass bezel with a quality hinge consumate with the period of the clock. It is unclear as to whether the bezel was originally blackened but it now has a lovely matt patina. The movement hasn’t been cleaned/polished but isn’t filthy and ticks away strongly even when laid flat without the pendulum. With original pendulum and a winding key (probably non original). All in all this is a lovely unmolested clock. We prefer clocks with totally original dials even if this means some rust and paint loss and believe these to be of far more historical value than repainted or refinished examples. That said, the paint loss on the dial could be sensitively improved with careful restoration but we will leave this for the buyer to decide. 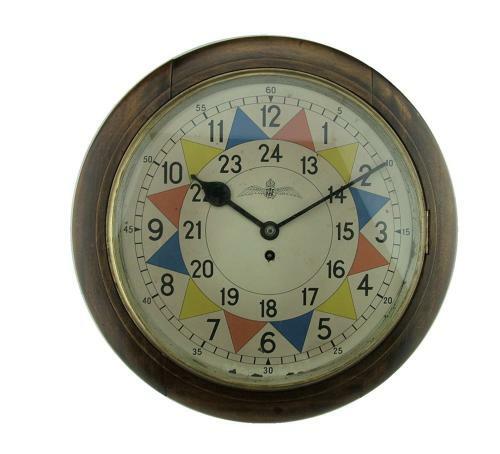 A very rare opportunity to own one of the classic clocks as used in the WW2 Operations rooms of RAF stations. A very good working display item. This is a large and heavy item. We would prefer the buyer to collect but will post worldwide. Please note whilst we will pack this item with extreme care most courier companies will not insure clocks in transit. Many more photos are available now on request. Stock code C22196.